+ If there are companion bills in the House and State, testify for both because they will be voted on separately. House bill start with HB and Senate bills start with SB. + Online testimonies should be submitted 24 hours prior to hearings or be considered late and risk not being included. 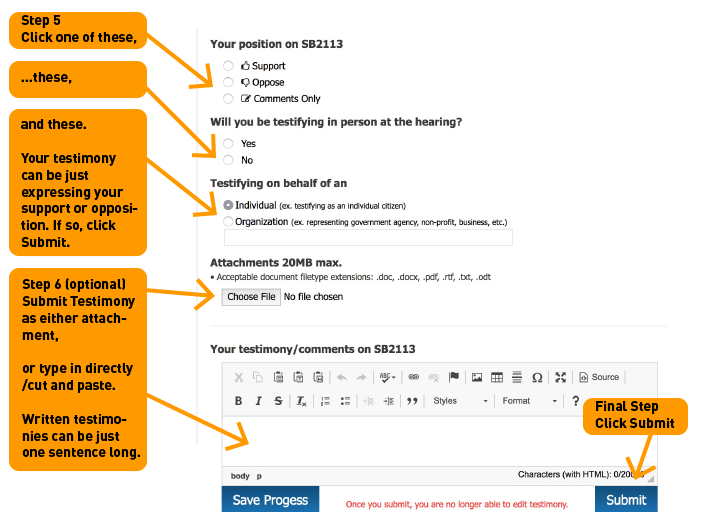 + Online testimonies can be just checking the support or oppose boxes, or consist of a one-sentence written testimony. Often it is a numbers game, - meaning the more testimonies, the more likely the legislators will pay attention to the bill. + If you intend to testify in person, you can pre-submit your testimony or just show up at the hearing & sign in. In-person testimonies are best no longer than 2 minutes. + In-person testimonies have greatest impact partially because it sends legislators the message that they are being watched. + The person that appears at the hearing does not necessarily need to the same person who submitted the written testimony. The person/s who appear at the hearing can say, “I’m here on behalf of ___" or on behalf of a group.